İstanbul enchants its visitors with its night life activities, too. If you feel like going out at night, here is our list of suggestions. 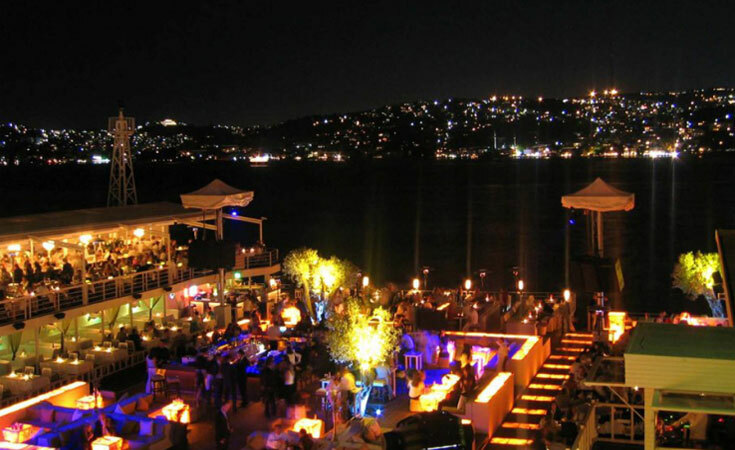 Sortie is the French word for “exit” and the club is in Kuruçeşme, a neighborhood along the Bosphorus. The view is amazing and what Sortie offers is good food, good music and quality entertainment. Sortie is open all year round and there are 7 different restaurants addressing all choices from the international cuisine during the summer. Sortie restaurant welcomes the guests during winter. The view can be enjoyed all day and night and you can enjoy the popular dancing tunes here. Anjelique opened in Ortaköy, in a three-story seaside mansion and it has been frequented by those who like to have a night of entertainment after a delicious dinner. The kitchen focuses on the Mediterranean cuisine and different genres of music is played on each floor. World famous DJs will make you forget about the time until the daybreak. It is a privilege to enjoy the music against such a view. Club 29 opened in 1993 and soon became one of the most popular venues in İstanbul; now it is considered as one of the classics. The view here extends to both bridges on the Bosphorus and the terrace is the best spot to enjoy your drink. DJ performances are on Friday and Saturday nights at the night club and there are special event nights now and then. Reina was established in 2002 and one of the things that make it special as one of the most famous night clubs is its upscale restaurants. Reina is both a place that hosts world famous celebrities and statesmen and also a non-stop clubbing center. Reina is located just under the Bosphorus Bridge and you can enjoy quality music until the first lights of the next day here. 360 is in the historical Mısır Apartment Building on İstiklal avenue and covers a large terrace that has a unique İstanbul view from high above. The venue has been awarded by international institutions several times and is named after its 360 degrees viewing angle. The restaurant is specialized in dishes from Turkish and international cuisine and you can listen to guest DJs from all around the world here. You shouldn’t miss the dance shows and live music performances at the weekends when you will mostly hear Soul, R&B and House music.